Where do I use my Hope Fashion voucher code? Browse through a wide array of women’s clothing at Hope Fashion including tops, knitwear, bottoms, dresses and outerwear, all of which is incredibly stylish and suitable for women of all ages. If you’re looking for the latest, most popular pieces you can browse through the new in section where you’ll find an array of great products that are updated regularly, as soon as new items come in. Hope Fashion also includes the ‘Foundation Collection’ on their website; an impressive collection that includes simple base layers that can be worn alone or with other pieces from Hope Fashion to create a stylish look that works for you. If you’d like to browse through the newest collection and this season looks then checkout the Hope Fashion lookbook. This digital book contains exclusive pictures of all the pieces in the new collection, all of which are available to buy online at Hope Fashion. This lookbook is updated every time a new collection comes in; always allowing you the chance to browse through a selection of new pieces quickly and easily. As well as great clothing collections and lookbooks Hope Fashion also boasts a handy blog section on their website. Here you can find all about how the founders of Hope created a place where women can come to feel stylish and confident all year round. In the blog section, you can discover numerous posts dating back years, you’ll also gain access to new blog posts that are added to the section every week. The articles available in the Hope Fashion blog section draw attention to important fashion issues including ‘why women aged 50+ are more invisible in the fashion industry’, as well as more laid back topics such as recycled cashmere and summer/spring looks. If you’re looking to fill your wardrobe up for less then check out the Hope Fashion sale section. Here you can discover a wide array of women’s fashion with amazing discounts of up to 50% off. Discover all sized clothing including free size, super slim, curvy, super curvy and dual slim regular pieces as well as items of all different colours. The Hope Fashion sale section is updated regularly, allowing you to find the latest pieces with huge discounts. If you want to keep up to date with when new items are added then sign up to the newsletter to be notified as soon as possible. Freshen up your wardrobe with a denim look, an easy to wear tunic dress, or a button through long line shirt dress and stay cool, casual and stylish all summer long. During the winter months opt for a cosy jumper dress or choose a smart, formal dress for work and professional events. If you’re shopping for an occasion dress you can discover a huge array of pretty, patterned dresses ideal for garden parties, cocktail parties, nights out and evenings. Shop by size or colour to find your ideal style of dress at the right fit, you can also browse through customer reviews of multiple dresses to find which pieces are well recommended by previous customers. If you are not entirely happy with an order you can return it free of charge within 14 days of receipt for full price return, provided that the products included are returned complete, in perfect condition, unused, unwashed and with the original packaging including the swing ticket and 'changed your mind' tag. Hope Fashion offers a collection of elegant, relaxed pieces that allow women of all ages to look and feel beautiful and confident. Hope Fashion provides contemporary simplicity that allows you to get on with being a busy, sociable woman, while still looking effortlessly stylish. 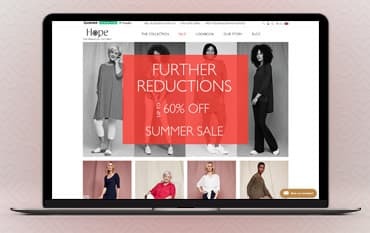 Shop online with a Hope Fashion promo code from us and save money on a variety of clothing including tops, knitwear, dresses, outerwear and much more. You can also enjoy a great sale section and gain excess to the free trouser alteration service, plus much, much more.